Written on December 1, 2018 . Posted in Blog. As winter settles in, dry air becomes a problem for many people. If you’re experiencing symptoms like severely chapped lips, coughing, and even nosebleeds, you’ve probably considered getting a humidifier. Sounds like a good plan, but here are several things that’ll guide you through this purchasing decision. While some HVAC companies might recommend equipping your home with a system-installed humidifier, which works to add moisture to the air in your whole house, we try to give our customers as many different factors as possible so they can make an informed decision. 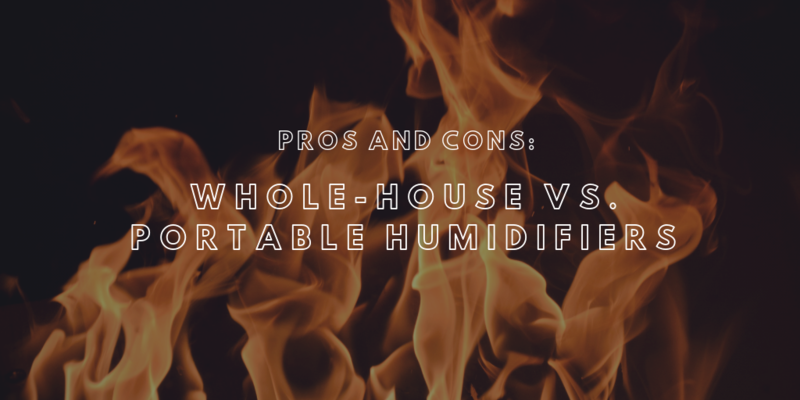 If you choose a whole-house humidifier we offer several brands depending on your needs. Call us and we will be happy to help you select the right one for you. If you decide that a portable is your best choice, Grainger makes some of our favorite portable units. This humidifier features a digital display for accurate humidity-level readings so that you can adjust it to your personal preference and it allows you to control the amount of air and noise the machine gives off. They run for about 55 hours at a time, requiring you fill it’s 5-gallon reservoir every 2 days. If you’re not looking for something that high-tech, you can usually find a small unit at your local Target or Walmart for $20-$30. Both products are going to give off moisture that can combat the effects of dry air and are easy to clean and maintain. To do so, follow the instructions that come with your unit but simply put, empty the excess water, wipe out the unit after every use, and don’t leave it running when you aren’t using it. If you clean your unit according to the manufacturer’s instructions, you will have an effective and low-risk solution to your dry air problem.